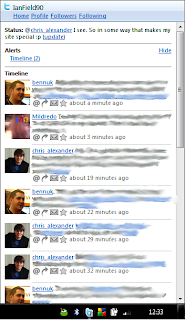 Lately I can't help but notice people raging on Facebook about how Windows Live Messenger (commonly called MSN) refused to let them log on and resorting to using Facebook chat, then raging about the issues with that after it grinds to a halt with the sudden unexpected user increase and load on the servers. I have been largely unaffected by this due to the fact that I have lately been using Digsby - an IM, Email and Social Networking client. Digsby isn't just easy to use, it looks great too. Customisations and little things that make it 'just fit' on my desktop. 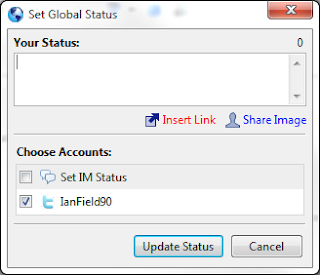 A system tray icon notifying you of updates for the social networking side of things; with a quick access to view them without opening a separate window. One of my favourite features is the option to dock the buddy list on the side of the screen and auto hide it. Making it act much like a toolbox in Visual Studio; hover over and view. This doesn't clutter your desktop and allows easy access. Tweeting even allows you to insert a shortened URL with ease using the provider of your choice. As if that wasn't enough. The mascot should swing you into trying it out!